When taking on a refurbishment project it may be common understanding that jobs inevitably, and invariably, begin to grow arms and legs. Quite often the excitement and vigour of taking on such a project can obscure the naivety or ignorance in what that job may actually entail, or sometimes what started out as a small intervention, quickly becomes the complete dismantling of a wall. This was true of our valiant attempts to ‘simply’ redecorate the old living room in the traditional part of our croft house on Skye: what began as a simple redecoration became the stripping out of an entire wall. The original croft house had been built in the 1920’s when my great-great grandfather and his family moved from Aird on Lewis, over to the Minginish peninsula in the West of Skye. The move was part of a government drive to pull people closer to the mainland following the Highland Clearances of the previous century. 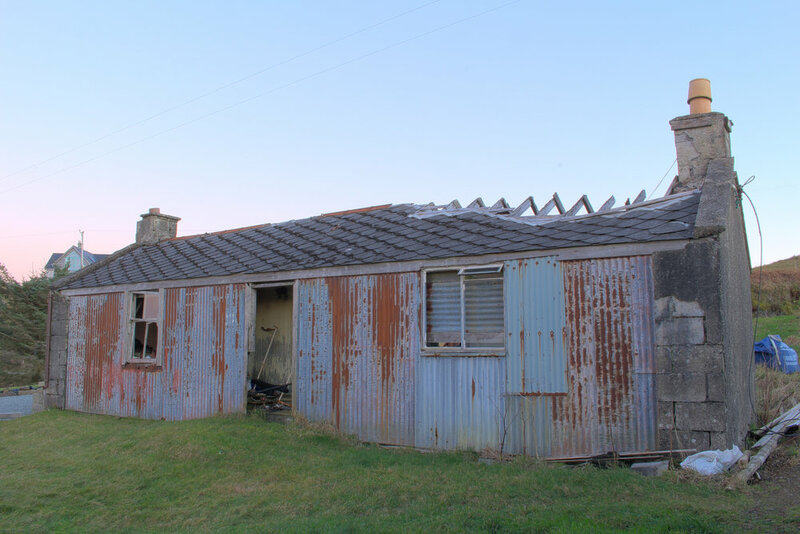 The board of agriculture offered the incentive of land for crofting and some modest materials to form a temporary shelter before a more substantial croft house could be built. That croft house was known as Cottage Type 6A. The original croft house was based on a generic plan of three habitable spaces with a connecting hall and entrance the front elevation. To the rear, a lean-to provided a scullery, larder and coal store. Original Type No. 6a in Fiskavaig - the Western most point of Minginish. You can make out the corrugated steel cladding and diamond pattern asbestos tiles. The building has fallen in to disrepair but the internal timber lining is still present. The houses were modest in construction and layout but managed to provide shelter in the harsh Islands weather. In our property, the fireplace had similarly been replaced and modern plasterboard lining fitted to allow for a wallpaper finish. For years a bulge in the wall, around the fireplace, made me feel a little nervous about what may be going on behind the lining - was the stone wall subsiding? My wife and I originally decided that we would just decorate this room, removing the dado band and giving it a fresh, white coat of paint - curiosity however got the better of me and I had to investigate. The first step was to try and remove the fireplace - I had no love for the tiled surround and hearth and was not too worried about damaging it. The thing weighed a tonne and it took a little while to coax it from the wall. The excitement of uncovering a random rubble stone wall was soon quenched by the state of the mortar and the fireplace. More importantly however it spoke volumes about the lack of care and workmanship when alterations had been made to the house - this was true of many other areas where workmanship was poor or inappropriate materials were used. 2. The opportunity for fitting a wood burning stove - especially since this wall would remain uninsulated. The idea is that the wall would take on the thermal heat from the stove, storing it within the mass of the stone and throwing it back into the room like a large radiator. We discovered the fire had a back boiler, with a pipe running up to the attic space and through to the kitchen - both tanks had long since been removed so this feature was redundant. Many stoves are fitted with back boilers to take advantage of the heat and use it to buffer the hot water. This is especially helpful as there is no Gas network on Skye and Boiler options are either electric, oil or liquid petroleum gas/gas canisters. With the extents of the plasterboard and timber lining removed, we could get a picture of the state of the wall behind. Quite a bit of the block work above the back boiler came away easily enough - this had been the source of the bulge I was worried about. Whilst removing the block work built around the stove, we noticed that the original lintel, comprising of iron straps between layers of rough poured concrete, had been chopped into to fit in the blockwork. I was a little nervous about the stability of the wall because of this however the weight of the stone above was nominal due to the void formed by the chimney flue. Regardless, it made sense to fit a new concrete lintel. Thanks to to the purchase of an SDS demolition drill, removing the blockwork was reasonably easy work, though I wasn’t aware there was still water in the back boiler and a slick of sooty water worked its way across the floor. 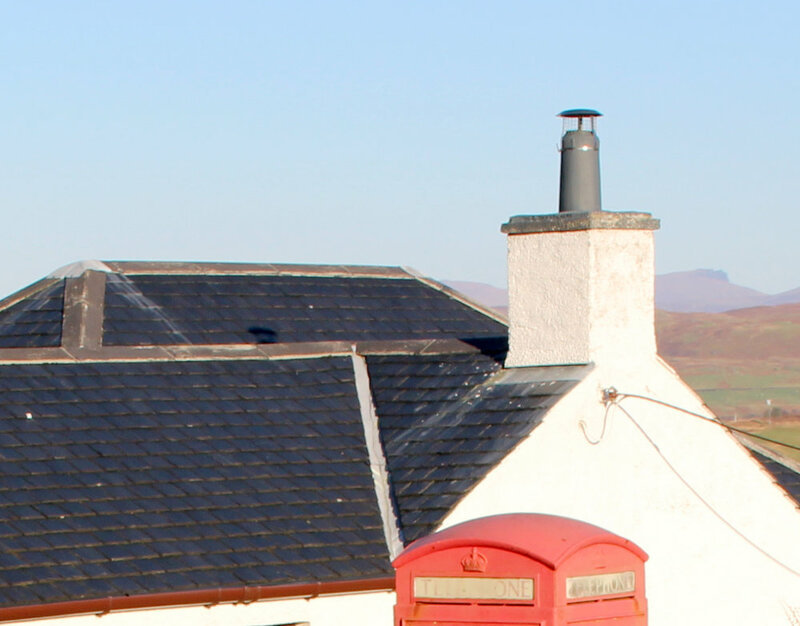 We purchased a 5kW multifuel stove, flue and all fittings from Alex at Bonk and Co. in Inverness. We felt the heat output would be sufficient for the space and it also keeps building regulation requirements simpler than a bigger stove. We wanted the stove to be capable of burning peat as well as wood. Checking the stove in the recess to see how it sits. The recess is a bit too big for the stove but we had a plan to reduce it’s size as part of fitting the new lintel. As we planned to fit a new concrete lintel, we would need an end bearing either side to take the weight spread across the lintel. 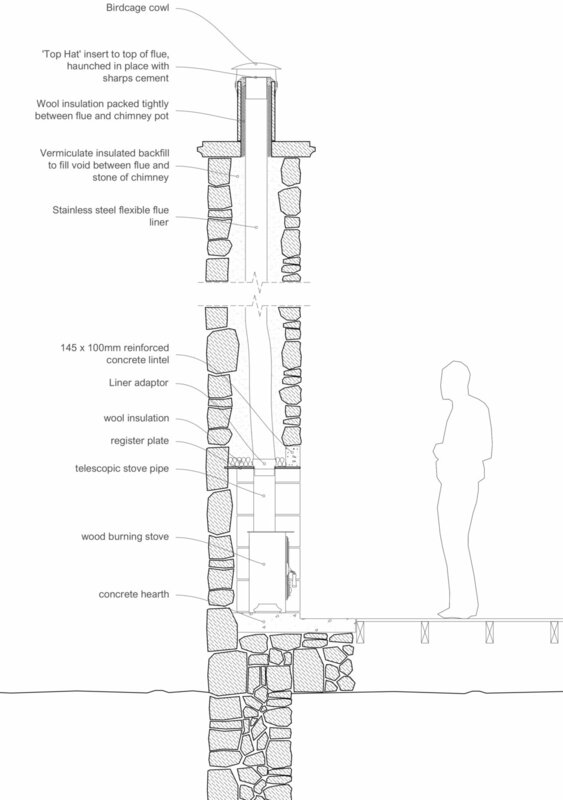 It made sense to build up a leaf of blockwork either side to provide this bearing and to reduce the overall size of the recess to something more in proportion to the stove we had purchased. We mixed cement mortar at a ratio of 4 parts Portland cement to 1 part builders sand and added water until the mix became ‘workable’. As this was my first attempt at building block, let alone mixing cement , I was dubious as to what ‘workable’ actually meant. In truth it became easy to determine whether the mix was too ‘dry’ or too ‘wet’. The mortar should hold its shape when mixed through but not be so thick that it appears grainy; it also shouldn’t feel ‘wet’ or have any excess water coming out of it when you lift it up with a trowel. This photo shows the dry mix of cement and sand. The first few stages of laying the block were relatively easy. I left 10mm between blocks for mortar and made any cuts using a grinder with a stone cutting disc. When I got to the top level of the block I needed to cut the block horizontally. I used the grinder to cut around the edge of the block, then used a hammer and bolster to cut off the excess - this was because the grinder I used only had a cutting depth of around 35mm. Here we see everything lined up - looking good so far! In the foreground you can see the concrete lintel and the liner adaptor. The adaptor takes the stove flue pipe and connects it to the flexible flue liner - it sits above the register plate, with the bottom flange poking through the hole. Mineral wool is fitted above the register plate for a couple of reasons: 1. It returns heat from the top of the stove rather than lose it to the chimney, 2. It softens the back-filled vermiculate which is poured from above, down the sides of the flue. With the insulation in place, the last thing to fit before the vermiculate back-fill, was the concrete lintel. This had to be measured and cut - including the steel reinforcing rods which commanded quite a bit of effort! We mixed 3.5 NHL Lime to building sand 3.5:1 and added water until we had a ‘fatty’ mix. We kept mixing for some time and left it to become as fatty as possible before working it - thankfully we had an electric mixer for this! All that remains is to fit the stove. At this point my wife and I took a sabatical to Edinburgh for the birth of our first child - a cold, damp croft house in the sticks was not an ideal scenario for the impending addition!